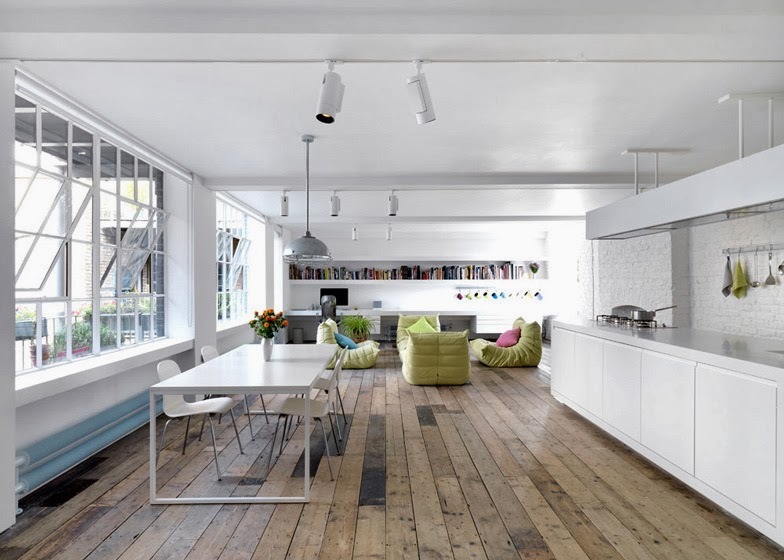 This open plan London loft in Bermondsey Street has been designed by Form Design Architecture with a minimalist approach. It is located within a former industrial building and has a characteristic wooden floor from boards that come from an old welsh chapel. 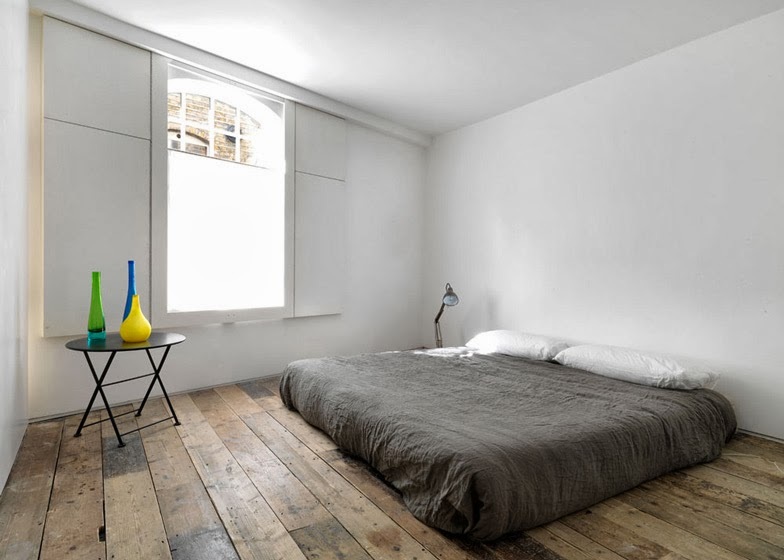 The whole apartment has been entirely renovated, leaving exposed brick walls that have been painted white, reflecting the original character of space. 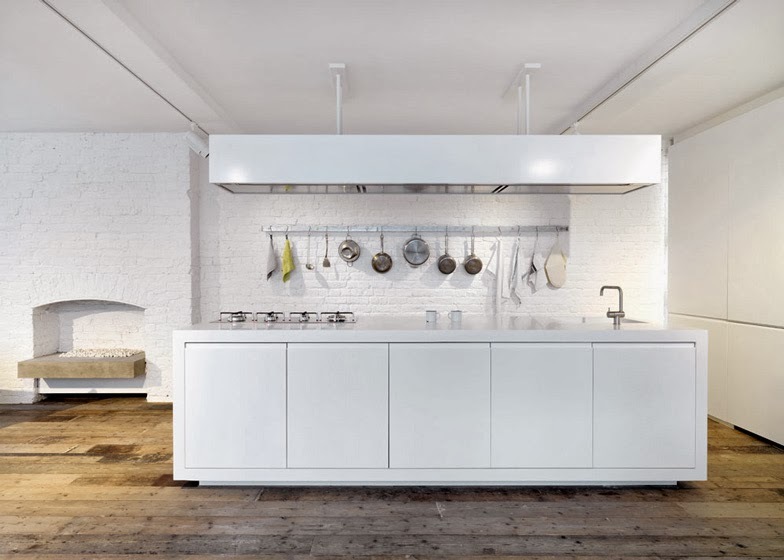 Fully reconfigured open-plan loft apartment within a converted warehouse with flexible zones for dining, relaxing and exercise plus washing/dressing/utility spaces concealed within a ‘floating’ white acrylic solid surface-clad block. 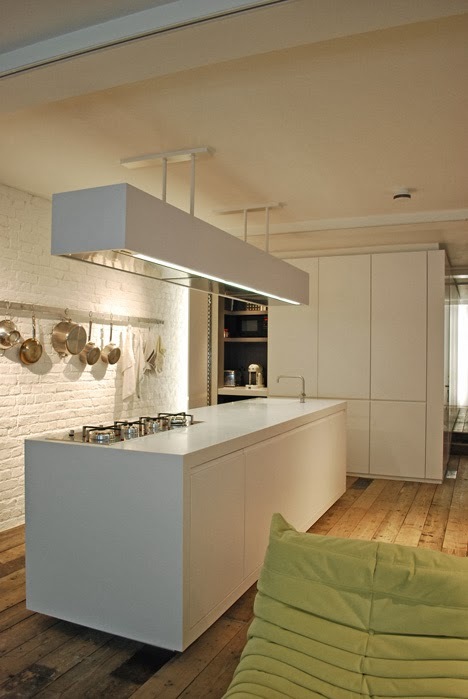 Our client initially approached us to carry out some minor alterations to his apartment to better meet his needs. 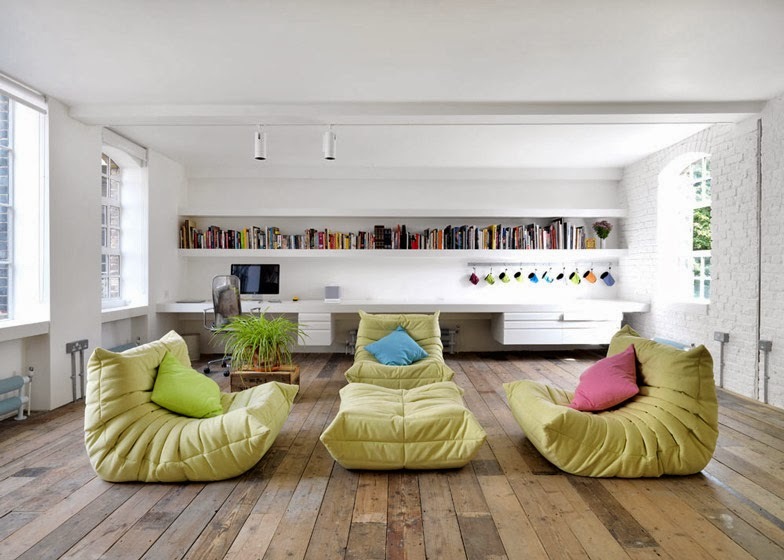 In discussion with him, the conclusion was reached that, having already had the apartment refitted once which did not work for him, the existing fit-out should be completely stripped out and a more radical approach adopted. 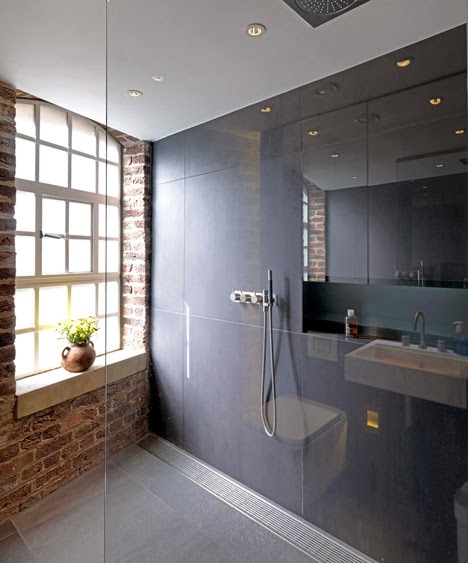 Detailed discussions established how the client wanted to use the space and identified elements of the original fit-out that were not needed, such as a second bedroom and bathroom, allowing a more relaxed, flexible live/work environment tailored specifically to his requirements. 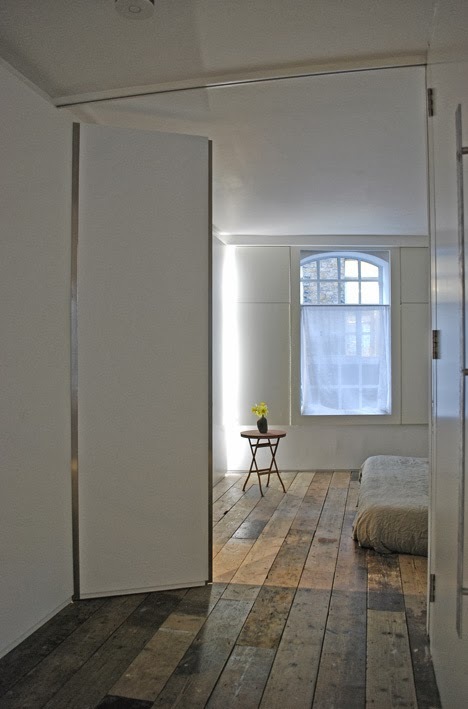 Having previously lived in New York, he was keen for the apartment to feel more like a warehouse loft reflecting the industrial character and scale of the space, which the previous 2 fit-outs had lost beneath raised floors, lowered ceilings and partition walls. Storage, bathroom and utility functions are contained within a sharply-detailed block which appears to be ‘parked’ in the corner of the now fully revealed 17m x 6m Loft. 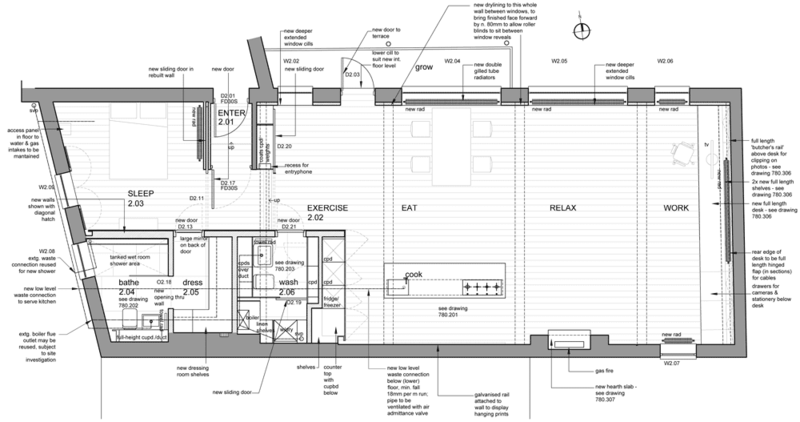 A similarly detailed linear counter block, supplemented by the adjacent fridge/freezer and ‘coffee larder’ concealed in the end of the main block, provides the cooking area. Our client says that he sometimes wakes up in the morning and still cannot quite believe that he is living in his ideal apartment. On Open House weekend, having initially intended to go out for the day, he delighted so much in the reactions of visitors upon entering that he found himself enthusiastically explaining the apartment’s features. 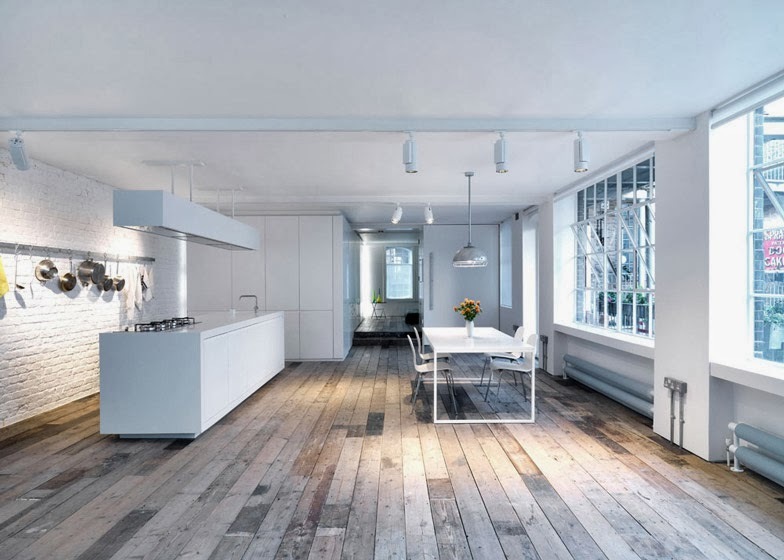 With the exception of the unfinished Pitch Pine plank floor (not actually original, having been salvaged from a Welsh Chapel, but the type of flooring that the warehouse would originally have had), all surfaces and fittings including exposed brickwork are finished in white; the crisp machine-made quality of the HiMacs solid acrylic finished kitchen and service blocks setting them apart from the more hand-made and time-weathered surface textures of the original Industrial building. 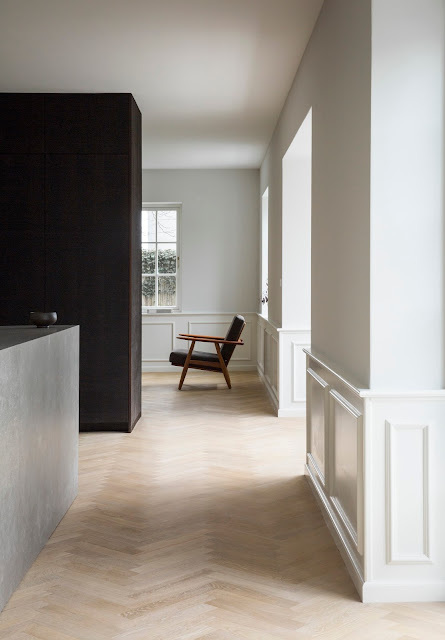 Surface finishes within the service block are all in dark grey, accenting the idea of a fruit or jewel-case-like object with a smooth exterior skin contrasting with a darker, more sensual core. Removal of previous sub-divisions allows shafts of sunlight from the newly-exposed windows in the South and West walls to animate the space to supplement the softer light from the almost fully glazed North wall which faces the courtyard of the building. 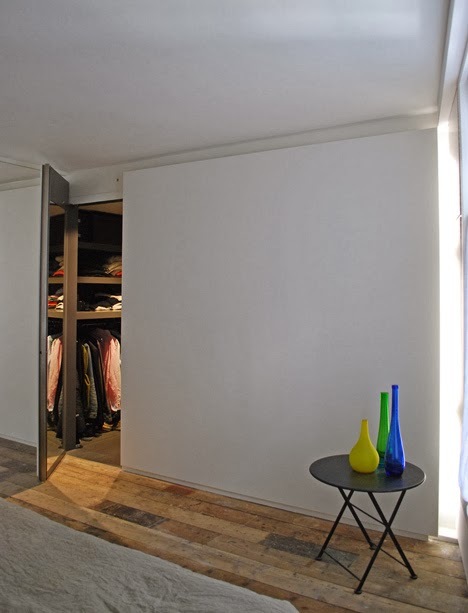 At one end of the open Loft, a concealed sliding wall allows the sleeping area to be fully enclosed if required. 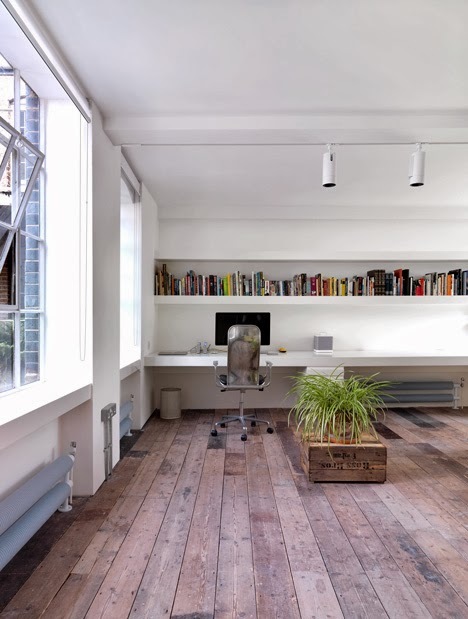 At the other, a full width desk and shelf, also finished in white HiMacs, provide a work area for the photographer owner. The problem of trailing cables is removed by a continuous cable tray along the back of the desk, covered by lift up flaps. 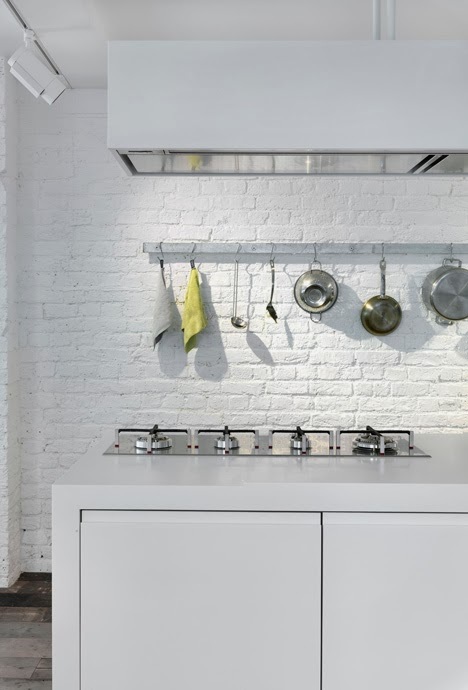 Programmable latest-technology low energy LED lighting from Zumtobel and AlphaLED, controlled by a Lutron system, allows different settings for a range of activities (work / gym / cleaning / watching TV) at the touch of a button.